Is your birthday coming up? Ask your friends and family to donate to BCSSF in lieu of a gift. Are you an athlete? Walk, swim, bike, hike or kayak for a good cause. Collect pledges from your friends, colleagues, neighbors, and family. Do you have a special talent? Host a bake sale, art auction, or craft fair in honor of families struggling with severe mental illness. Have a great fundraising idea but don’t know where to start? We are here to support you! 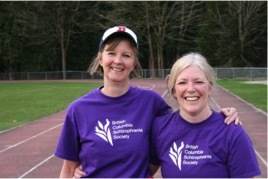 We can help you create a fun and rewarding event or you can dedicate the proceeds of an existing event to the BC Schizophrenia Society Foundation. If you want to work on your fitness while contributing to the community, BCSSF is the charity of choice for the BMO Marathon, Half Marathon or 8K Run4Hope Charity Run.